Halloween is coming in a few days and here is the first of my Halloween projects this year. I wanted to rebuild an cool Arduino project I found on YouTube - the pumpkin with moving eyes. The project is not complicated and easy to rebuild. Now we see how to do that. Instructions: Cut the tube and the wooden stick to the same length ~ 40mm. Hot glue the wooden stick to the back of the eye. Drill a hole at the end of the wooden stick. Also drill a hole into the side of the eye and one on the opposite side (see photo). Put the nail through the holes, place the eye inside the tube and hot glue both ends onto the tube edge. Move the stick at the back side of the tube should now be moving the eye. 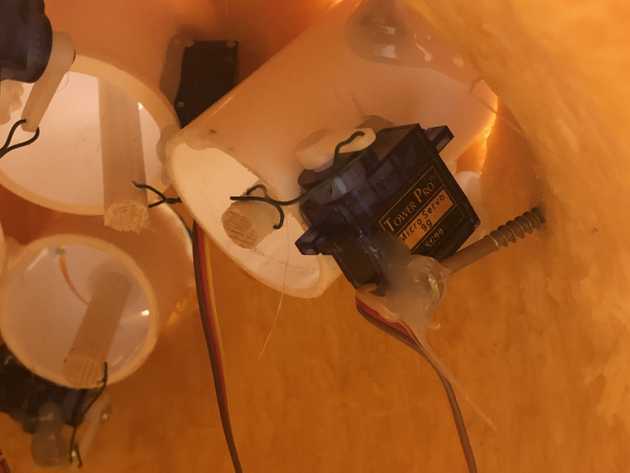 To mount the servo hot glue it in a 90-degree angle to the wooden stick on the back side of the plastic tube. 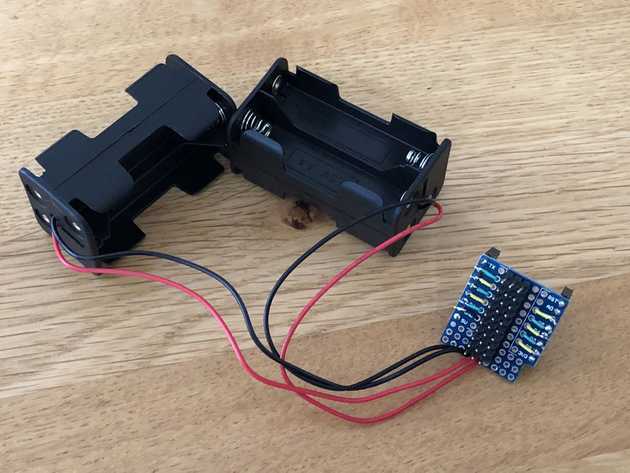 Use the wire to connect servo with the end of the wooden stick. The wire must be strong enough not to bend and move the eye. To move 10 servos with a small Wemos board we need some extra power. 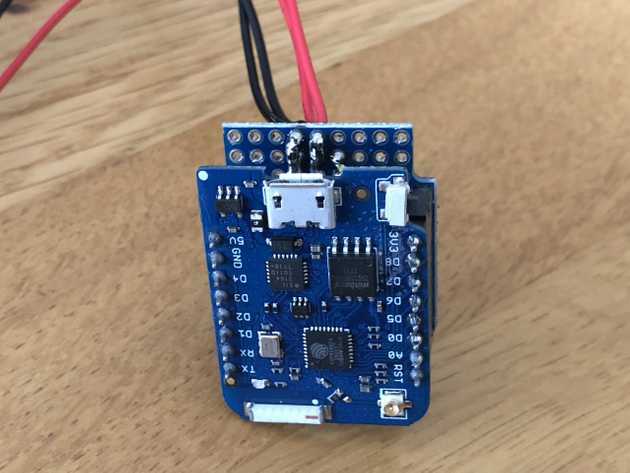 These small ESP8266 boards can only handle a current of ~500 mA in total max, enough to control two or three servo motors. To solve this, I use AA batteries as an additional power source to run all 10 servos. 2 boxes of 4 AA batteries in parallel provide 6 volts and enough juice to run the servos. The battery box(es) are connected with ground row (black wire) and positive row (red wire). If more than one battery box is used to provide more power they must be connected in parallel. Compared to the hardware assembly the software is relatively simple. 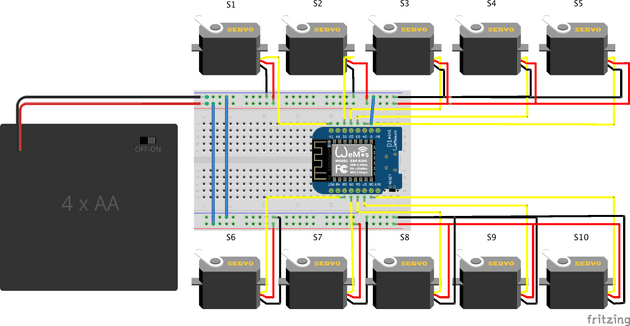 The small program controls an array of 10 servos and changes them randomly between an min and max position value. A short delay makes the overall eye movements more random. The full code is on GitHub. Instructions: Use the marker to mark 10 circles with the size of the plastic tube used for the eyes. These should not be too close to each other to still have enough space inside. 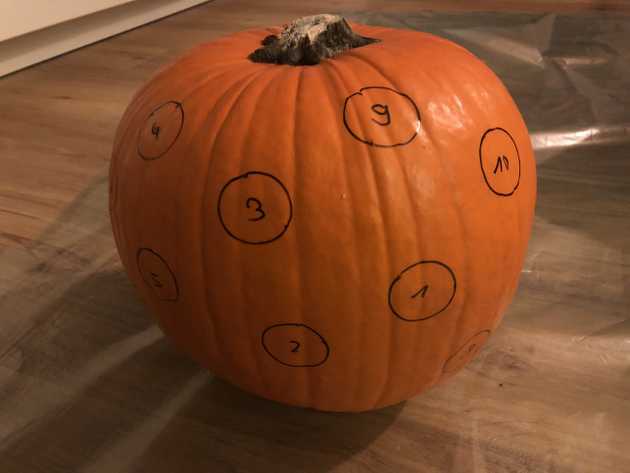 Cut around the stem of the pumpkin at an angle. Make it big enough, this will make connecting the eyes later much easier. After done cutting, all the way around, remove the stem and the guts from the pumpkin. 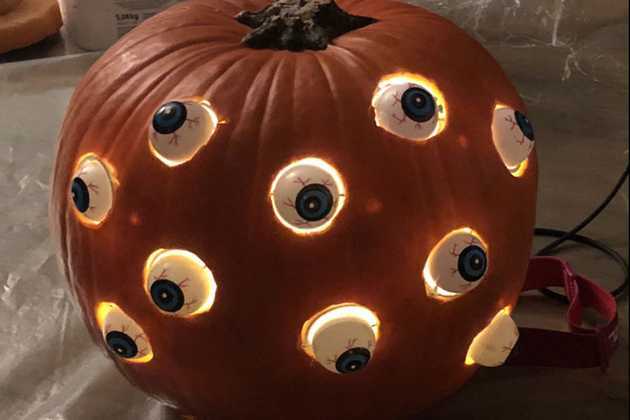 Place the eyes in the holes and fix them from the inside with hot glue. The challenge is hot glue does not stick so well on pumpkin pulp. I turned screws into the pulp to help to fix it.